Are you using LinkedIn InMail? The numbers are in and LinkedIn InMail’s response rate is three times higher than a regular email. This could be your secret weapon to success. You only get one shot at a first impression, so make it a good one. Here is a Google doc with four templates to copy and paste right now. First and foremost, the perfect cold InMail should spark conversation. Here are the best ways to get a reply and what to avoid. Keep in mind your number of credits and send LinkedIn InMail only to top prospects. Get specific. Personalized messages receive nearly 50% higher open rates and nearly 22% higher reply rates. Write an attention-grabbing subject line. Email subject lines that imply quick action receive a 93% open rate. Directly address how you will benefit them. Make the message about the recipient. Research their LinkedIn for pain points or interest points. Spark a conversation versus simply trying to get your point across. Overwhelm your prospect with multiple questions or a lengthy message. Make it all about you. Instead, focus on the benefits you have to offer. Send the same generic message over and over again. Forget to fill in all custom fields. If you’re using a template and a field is left unattended, you’ll lose your prospect’s trust. Show them that you did your research. If you went to the same college, have similar skills/hobbies/expertise, or have a similar connection, mention it in the subject line. Use their first name: Seeing your name is satisfying and is a simple way to catch your prospect’s attention. By directly addressing them, there’s immediate warmth and it makes the message about them. Want to know when your emails, links, & attachments are opened? The number #1 rule of LinkedIn InMail? Don’t ask for a meeting. Asking for appointments will hurt your response rate by 90% to 97%. Ouch. 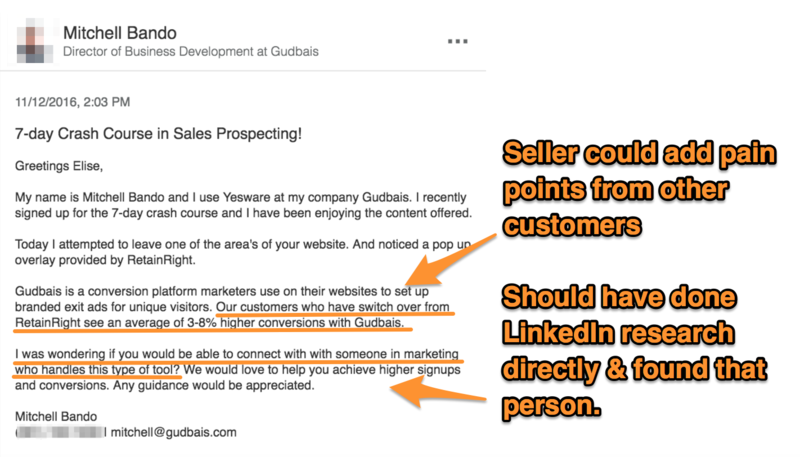 The sole purpose of your first cold LinkedIn InMail should be to make a connection, build rapport, and provoke curiosity from a potential buyer. This is your chance to highlight a pain or share useful information that your prospect needs to know about to make an informed decision. Personalize the very first sentence. Lead with direct value, not yourself. Jumping right into who you are and what your company does risks losing them from reading the rest. Candidates aren’t necessarily looking for a job change. It’s the recruiter’s job to entice them into turning the tables. If you’re sending cold InMails, make sure your LinkedIn profile is up to date. If you’re writing on behalf of your company, it should be clear what your role is and how that fits in. The subject line addresses an emotional pain point. 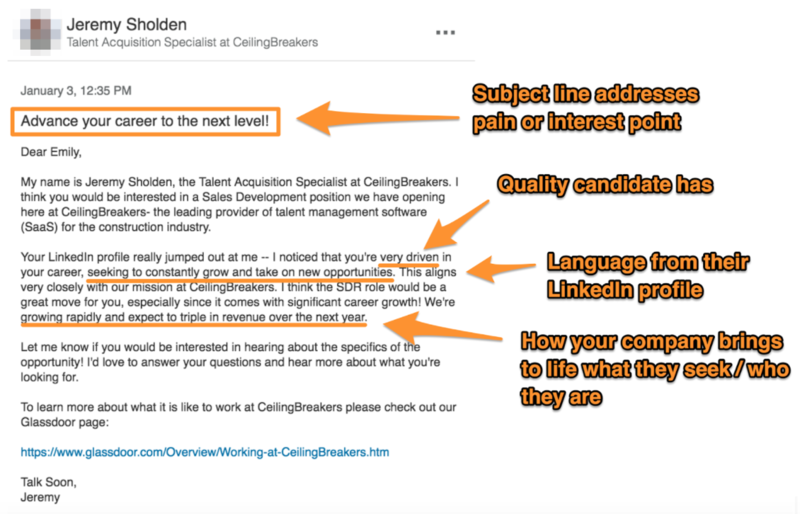 It’s clear they did their research – the author provides specific details and language from the recipient’s LinkedIn profile. This makes the recipient link themselves to the potential career change (if they weren’t looking). Background on the company and what they offer. Save emails you keep re-writing as customizable templates in your inbox. Networking happens in real life all the time, and there’s no harm in sending InMail (and a LinkedIn request) immediately after your encounter to stay connected going forward. . They call back specifically to where you met. Use flattery towards the recipient. Asking for a favor is an art form. Don’t immediately bombard your recipient with the question. Provide your recipient with context on how you found them and your background before diving right in. Here’s an example from Joshua Waldman’s Career Enlightenment for professionals connecting with a hiring manager. Context on how they found the recipient and experience with company. A soft ask for the favor. The sender’s background and qualifications (i.e. why they should do the favor for you). So, do you InMail? What are your favorite ways to get replies? Let us know on Twitter: @Yesware.